Thank You. Merci (French). Efharisto (Greek). Mahalo (Hawaiian). Grazie (Italian). Click here to learn to say “Thank You” in other languages. The Princeton Dictionary defines gratitude as “a feeling of thankfulness and appreciation”, and Wikipedia describes it as “a positive emotion or attitude in acknowledgment of a benefit that one has received or will receive”. 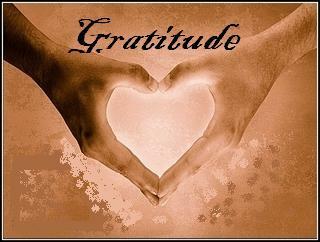 Gratitude is mutually beneficial for the giver and receiver, a win-win situation. “Thank You” feels good whether you hear it or say it, especially if you are blessing someone’s life. Recent attention has been brought to the importance of gratitude in manifesting one’s desires. Law of attraction suggests advanced praise activates attracting one’s desires. Spirituality also confirms the importance of remaining grateful in every situation as a way of activating and receiving blessings. Neale Donald Walsch, author of “Conversations with God”, suggests our souls choose certain situations ripe with valuable lessons to gain greater wisdom. He reveals that accessing this knowledge shifts one’s perspective to automatically engage gratitude. Gregg Braden, author of “The Divine Matrix”, suggests gratitude is fundamental to our survival as we approach 21 December 2012, the dawning of a new world age. He reveals the future of the world is currently being shaped by what people choose to believe, and the future is literally being created by the thoughts people think. Gregg states this new world age accounts for many people who have been affected by the random passing of loved ones and other curious events in recent years. He shares that we are being offered massive growth opportunities to step into higher consciousness and experience a greater sense of gratitude than ever before. How can gratitude work for me? Ask, and You shall receive. God (or Jehovah as I call Him), or however you choose to address Him, spoke to me as clearly as if you and I were having a conversation. He said, “Stop asking me for things, and start trusting Me. Surrender your heart to Me. You are my child, and I know your heart. I love you and am working all things out for your good even if it doesn’t make sense now. Pray with praise as if you have your heart’s desires. Say ‘Thank You’ instead of ‘Please’, and remember to praise on others’ behalf, too.” The Voice disappeared as quickly as it appeared, and I sat in humbled in silence. “Rejoice in the Lord always. I will say it again: Rejoice! Let your gentleness be evident to all. by prayer and petition, with thanksgiving, present your requests to God. Did I imagine The Voice? Could something this simple really work? The ink pen had embossed lovely scrolls on the paper where I had been scribbling without success. I took a breath and said, in my head, “Thank You for this pen writing.” The pen magically began writing within seconds. I was certain it must merely be coincidence. I began testing the gratitude principle on other things, including a challenging situation beyond my control, and even that began to transform almost instantly. I was quite pleasantly surprised by the immediately positive results …all from saying, “Thank You” in advance. I was, in a word …astonished. Why is gratitude so effective? Doors open. Light bursts through windows. Possibility blossoms. Blessings bloom. Miracles manifest. Gratitude is the ultimate confirmation of faith because it is so certain of receiving that it praises in advance. Someone once explained it to me this way – we know gravity is a law; therefore, we go through the day trusting it is active without questioning it. True faith is the same principle. We walk in belief knowing that we will see what we believe versus waiting to believe until we see. Gratitude is our Love Song to The Creator. The Power of Gratitude is dedicated to Amazing, Gorgeous, Talented, and Wonderful You. Thank You, My Dear Readers, for sharing your kind comments and radiating your awesome light. You are a gift. You are BeLove(d). Shine on.